POODLE stands for Padding Oracle On Downgraded Legacy Encryption. This vulnerability allows a man-in-the-middle attacker to decrypt ciphertext using a padding oracle side-channel attack. POODLE affects older standards of encryption, specifically Secure Socket Layer (SSL) version 3 which was release in 1996. It does not affect the newer encryption mechanisms known as Transport Layer Security (TLS). How Can I Fix my Browser? Follow some recommended steps to disable SSLv3 support in your browser. Patches and software updates are mentioned latter in this article. Chrome had an update released in February that added a feature that in theory protects against this vulnerability, however someone people have claimed the adding –ssl-version-min=tls1 to the short cut will disable SSLv3 and earlier but I have not seen this work as in actually disabling SSLv3. Disable SSLv3 or lower on your servers, review your SSL Settings & make sure things are in the right order & following best practice which is pretty much to use TLS 1.0 or greater. I don’t feel that I’m experienced enough to give advice on Apache or any Linux HTTPS Deamons so I would advise that your check out the Linux community for your distro as they will most likely have information on securing your servers. As I’m more familiar with IIS (Internet Information Server) I’m happy to provide a link to Nartac Software Inc. GUI tool that allows you to set YOUR SSL settings, I recommend you set you server to the FIPS-140-2 standard using this software. Changing the settings on windows will also effect other services on you system so make sure you test production environments after making these changes. But remember even if you have an A ratting your site might still be poorly configured or have other issues. e.g. Some sites preference SSLv3 over TLS even though they have TLS enabled. SSLv3 = Never, the Bug is a fundamental design flaw of the protocol. This entry was posted in Internet / Online, Software / Applications and tagged Bug, CVE-2014-3566, Exploit, Man-in-the-middle, MITM, POODLE, Security, SSL, SSL 3, SSLv3 on October 21, 2014 by JAB_au. The following list is the result of an attack on RockYou.com whereby a hacker managed to obtain all the account details of 32M users. What is the most popular password? This entry was posted in Software / Applications and tagged Security on January 23, 2010 by JAB_au. Spammers have found an open redirect in the sun.com website. These redirects are often used to mask their URL’s from RBL’s and services like Spamcop. Google is used purely as an example. This entry was posted in Internet / Online and tagged Security, Spam on June 24, 2009 by JAB_au. There have been some reports around the place of a vishing scam targeting the Commonwealth Bank. An automated phone message is used and tells you to call the number (02) 8005 6713, if you call this number you will be asked to provide your credit card number and your four digit pin number. Some people have reported receiving this phone number via email also. If you have fallen for this scam and called 02 8005 6713 then you should contact the Commonwealth Bank immediately. This entry was posted in General and tagged CBA, Commonwealth Bank, Phishing, Security, Vishing on June 3, 2009 by JAB_au. OK so I got sick of McAfee SiteAdvisor the new layout of their site is horrible and not user friendly, the button in your browser interferes with the aesthetics of the browser. SO now I have replaced it with WOT. WOT is a free Internet security addon for your browser. It will keep you safe from online scams, identity theft, spyware, spam, viruses and unreliable shopping sites. WOT warns you before you interact with a risky website. It’s easy and it’s free. The best part about WOT is that it’s community driven and not rapped up in the interests of a company like McAfee. This entry was posted in Software / Applications and tagged Security, Web Of Trust, WOT on May 16, 2009 by JAB_au. Spammers have found an open redirect in the ask.com website. These redirects are often used to mask their URL’s from RBL’s and services like Spamcop. I have put Microsoft in as an example here anyone can put any URL in at he end to use this redirect. I have filed a support ticket with Ask about this. This entry was posted in Internet / Online and tagged Security, Spam on April 22, 2009 by JAB_au. 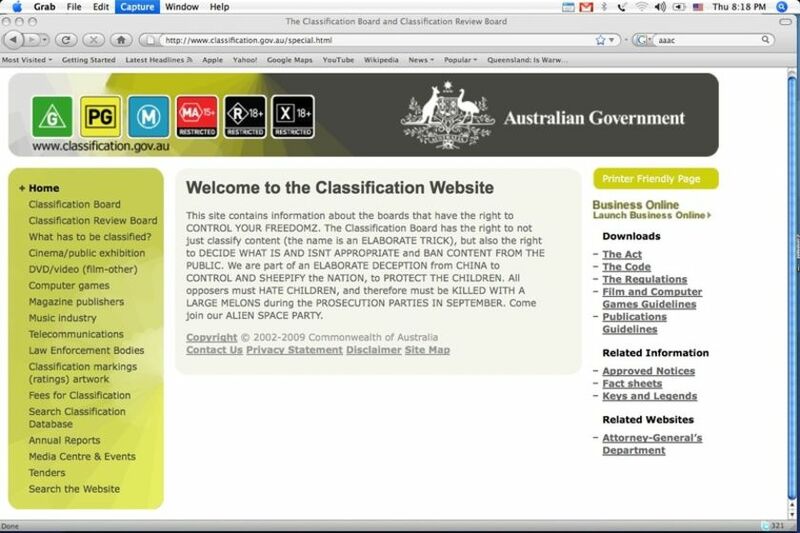 The ABC is reporting that the Office of Film and Literature Classification (OFLC) has been defaced. At present the site appears to be down displaying the message “Bad Request (Invalid Hostname)”, however the ABC has been kind enough to capture a screen shot with there article. This site contains information about the boards that have the right to CONTROL YOUR FREEDOMZ. The Classification Board has the right to not just classify content (the name is an ELABORATE TRICK), but also the right to DECIDE WHAT IS AND ISNT APPROPRIATE and BAN CONTENT FROM THE PUBLIC. We are part of an ELABORATE DECEPTION from CHINA to CONTROL AND SHEEPIFY the NATION, to PROTECT THE CHILDREN. All opposers must HATE CHILDREN. All opposers must HATE CHILDERN, and therefore must be KILLED WITH A LARGE MELONS during the PROSECUTION PARTIES IN SEPTEMBER. Come join our ALIEN SPACE PARTY. The last paragraph sounds kind of odd and is very random. Funny thing is the person who has done this is completely off target when it comes to who they should be after. This entry was posted in Internet / Online and tagged Government, Hacks, Security, Website Defacement on March 27, 2009 by JAB_au. Some spammers have found an open redirect in the go.com website. Today I received a peace of spam that was exploiting this redirect. Become loveworthy one! - Click! This entry was posted in Internet / Online and tagged Go.com, Security on March 8, 2009 by JAB_au. Microsoft has dropped an out of cycle patch on everyone, the patch covers a fault in RPC which is very similar to the fault in RPC/DCOM that was exploited by Blaster Worm. The consequences of not patching could potentially be the same, thousands of computer infected to do the bidding of those who would exploit it. Patch or die folks, patch or die. This entry was posted in Software / Applications and tagged Microsoft, Security on October 23, 2008 by JAB_au. So I’ve now got my hands on Windows XP Service Pack 3 (SP3), which was released on April 21st 2008. April 21st 2008 was the Release To Manufacturers (RTM) by Microsoft, SP3 will be released to everyone else on the 29th April 2008. Even though the public release is delayed Microsoft has the download on their site. See above. Microsoft has now officially released Windows XP Service Pack 3, so we can probably assume that they have fixed the little bug they had. This entry was posted in Software / Applications and tagged Microsoft, Patches, Security, Service Pack, Update, Windows XP on April 26, 2008 by JAB_au.